Why a History page? Because we have several musicians who have taught and played in the area for over 40 years, who are able to pass on names of players, stories and photos of students, workshop clinicians and special performances or events. These and many other items will make up a book commemorating music-making in Chapel Hill and Carrboro between 1964 and now. If you would like to contribute to the History page with an anecdote, a story, a photo, an mp3 file, please send a message on the contact page, and we will add your contribution. Thanks! 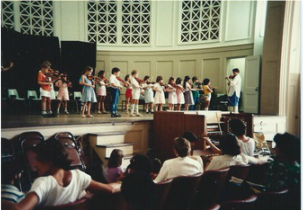 Music for Children, started by Dorothy and Edgar Alden in 1962 and continues to this day. 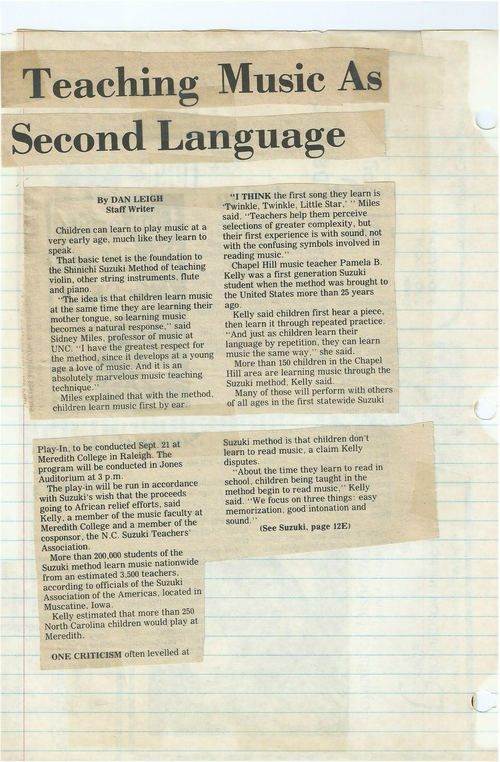 Music for Children, a not-for-profit organization, was formed to supplement music programs in Chapel Hill public schools and individual studios. Original bylaws states its purposes and objectives are: " to encourage, develop and support interest , appreciation, education and training in the musical arts among children of the Chapel Hill community; to provide opportunities for music programs, scholarships, grants of funds; to sponsor musical concerts and performances available to the children of this community, and to establish sponsors to encourage and support any projects consistent with the attainment of the foregoing purposes". 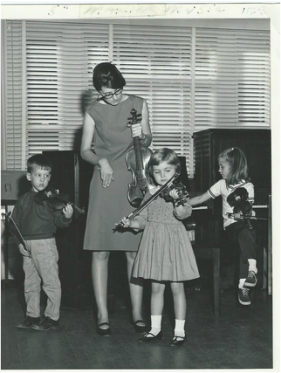 Dorothy Alden formed this group in this 60s providing valuable musical experiences for the local children (including James Taylor, yes, THE James Taylor) who played cello. The orchestra is still providing these opportunities in 3 divisions - beginners, intermediates and advanced. Here are some names of those who participated during their time in Chapel Hill. Please help in compiling the list of players and conductors. If you played in the orchestra, please send in your name and the decade you were a member and who your conductor was. 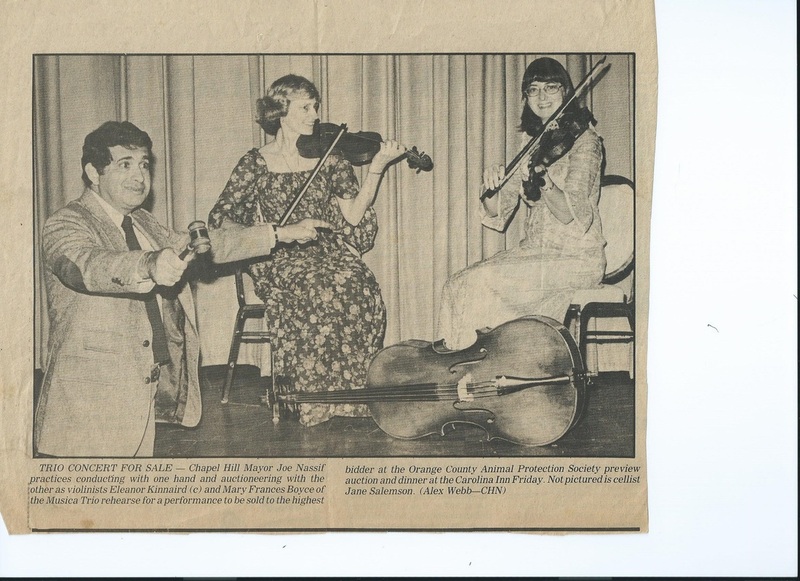 CHCSP - The Chapel Hill Cooperative Suzuki Project formed in 1969. Smith. Over the years many other teachers have enriched the work of the Project. 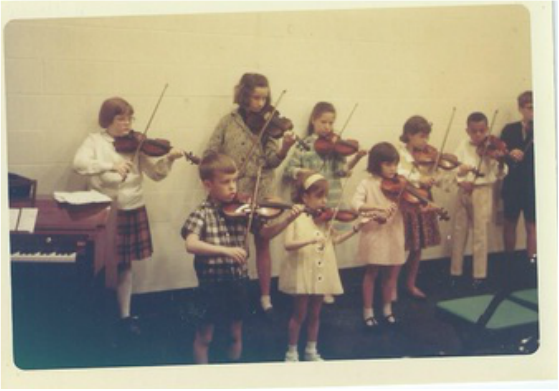 Currently about 50 teachers of violin, viola, cello, piano and flute are affiliated. A group class in 1968. The little boy in the front is Roger Brooks. We need names! Mary Frances Boyce, in the 60s. 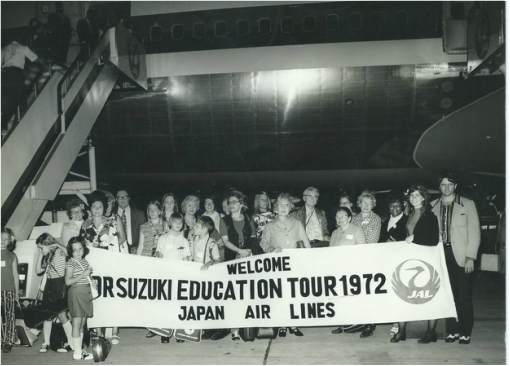 First tour to the US by the Japanese Suzuki Students. Arriving at RDU for their visit to Chapel Hill. What a great welcome! Do you recognize yourselves? Names please! 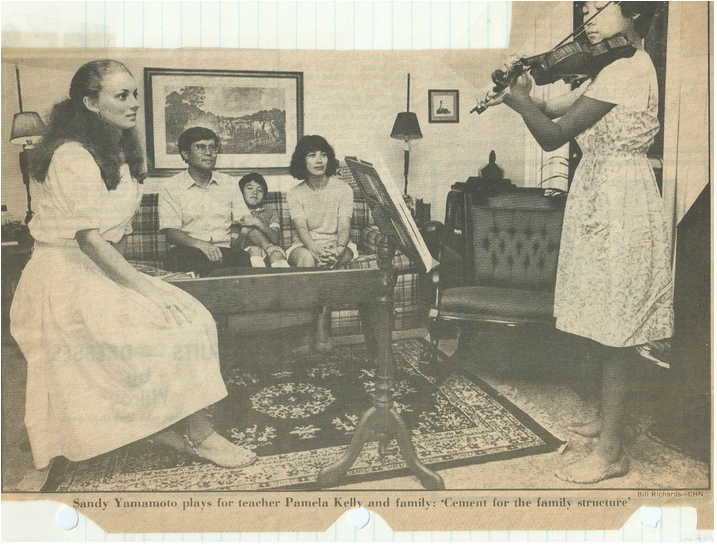 Sandy Yamamoto is now a professional violinist and former member of the Miro Quartet. Play-in at Hill Hall. Date? Teacher? 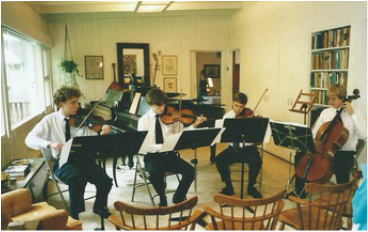 The Chapel Hill Chamber Music Competition ran for 12 years, providing an opportunity for young musicians to learn the art of ensemble playing and to begin learning the chamber music repertoire. Violins - Alan Lebetkin, ? In the 70s, Mary Frances Boyce, Ellie Kinnaird and Jane Salemson played as a trio for weddings and social functions. 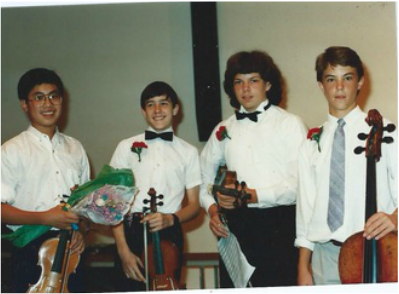 Other instrumentalists, such as a flutist, or a violist, would join in to make a quartet. 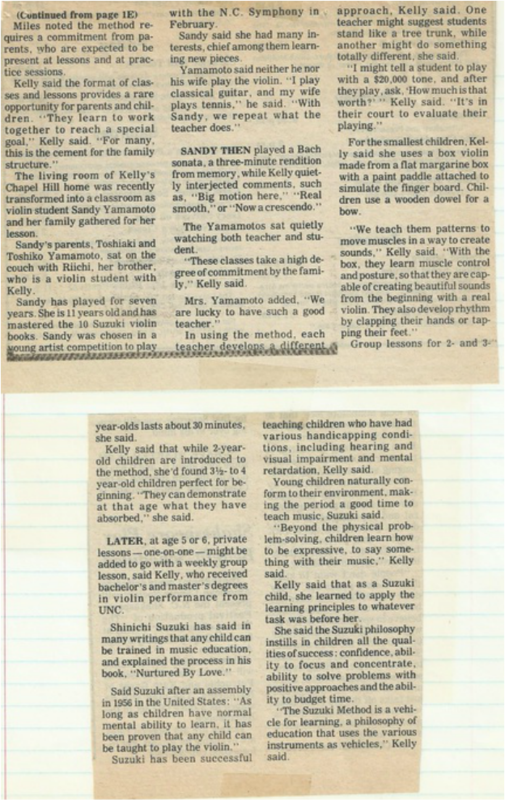 In the early 80s, Jane Salemson took her two sons to England, and on returning to Chapel Hill in 1986, found there was quite a demand for wedding music. Fran and Ellie had very busy lives and were not keen on administration duties, so Jane started doing the bookings and eventually Musica became the legal business which continues to this day.